The feast of our diocese and cathedral was celebrated on November 11, the feast day of Bishop Saint Martin. The guest speaker at the celebration was the Apostolic Nuncio of Ukraine. Antal Majnek diocesan bishop greeted the Nuncio and emphasized that his Excellence paid his first visit to our diocese when he arrived in Ukraine six years ago. The Bishop explained that our cathedral is Europe’s easternmost Saint Martin church still in function. It is heartening that our church is named after a saint who evangelized the whole Europe; Sait Martin of Tours is the second most popular patron saint for churches after the Virgin Mary. The Bishop then greeted Milan Šášik, Greek Catholic Diocesan Bishop; Zoltán Lengyel, mayor of Mukachevo; the priests and the faithful from all over the diocese who made their pilgrimage to the center of the diocese. 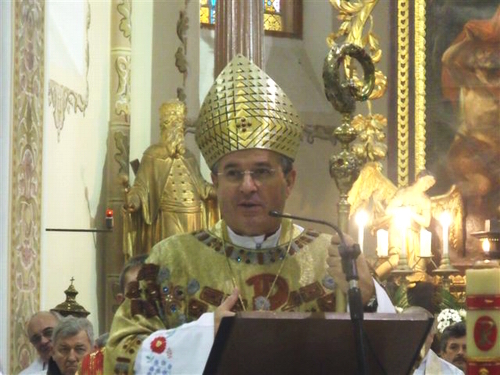 In his speech, the Nuncio encouraged the pilgrims to follow Bishop Saint Martin. He was a father to the poor and needy, said the Nuncio, and it is our mission as well to love our brethren the way this blessed bishop did. We need to pray for help from the Holy Spirit so that we – just like Bishop St. Martin - can recognize and fulfill the tasks He assigned to us. The holy mass ended with blessings from the three bishops and then the faithful sang the Papal Hymn, everybody on their own languages. Following the mass, the faithful of Munkachevo hosted a reception in the churchyard for the pilgrims, the priests and the bishops. So the celebration continued with a friendly conversation. After the reception, in the chapel of the cathedral, Nuncio Ivan Jurković addressed the priests and religious women coming from our diocese in a short exhortation. The Youth choir of Mukachevo-Palanok Parish sang at the mass.